An essential guidebook for anyone teaching college courses or leading training programs on classroom management. Help teachers establish win-win authority relationships with students and improve the overall climate in their classrooms, schools, and districts! Based on Dr. Bluestein’s book, The Win-Win Classroom, this guide gives staff developers and workshop leaders the tools to facilitate book study groups, seminars, and professional development events to help teachers prevent discipline problems, build student accountability, end frustrating power struggles, improve school climate, reduce failure and improve achievement, accommodate a wide range of learner preferences, and create a positive social culture with kids of all ages. 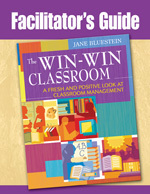 The Facilitator’s Guide to The Win-Win Classroom is ideal for college course instructors, staff developers, or anyone leading professional training for groups of any size—including study groups, small workshops, or large seminars. For all grade levels and for anyone working in a school setting. Use your credit card or PayPal account to order The Facilitator’s Guide to The Win-Win Classroom through a secure server online. Ask for an autograph. It’s free, too! An essential guidebook for anyone teaching college courses or leading training programs on classroom management. Chapter-by-chapter activities, questions, handouts, and more. All grades. Save 50%.